Enligt Retraction Watch så har Ohio State University sett till att en av deras tidigare doktorander har fått sin doktorsgrad tillbakadragen. En vetenskaplig tidskrift har nämligen dragit tillbaka en av hennes artiklar (samförfattad med hennes handledare) på grund av ”inkonsistens i datan”, vilket är ett förmildrande uttryck för något som inte har gjorts på ett korrekt sätt. Det gäller artikeln ‘Boom, Headshot! ?’: Effect of Video Game Play and Controller Type on Firing Aim and Accuracy som publicerades på nätet 2012 och som kom ut i tryck 2014. Artikeln argumenterade för att first-person shooter tv-spel förbättrar människors hanterande av riktiga vapen. Men under 2015 hörde andra forskare av sig och ville titta på datan ifråga, eftersom de hade upptäckt ”inkonsistenser”. 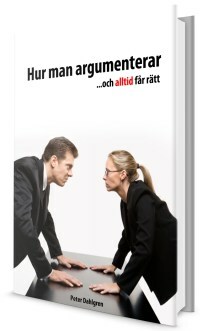 Men forskarna till artikeln kunde inte hitta datan, vilket är sannerligen misstänksamt. The editors of Communication Research, Drs. Gibbs and Knobloch-Westerwick, wish to issue a retraction of the article entitled ““Boom, Headshot! 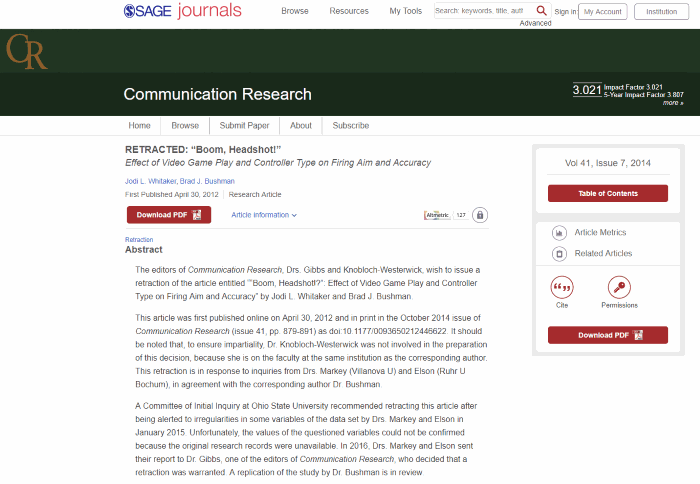 ?”: Effect of Video Game Play and Controller Type on Firing Aim and Accuracy” by Jodi L. Whitaker and Brad J. Bushman. This article was first published online on April 30, 2012 and in print in the October 2014 issue of Communication Research (issue 41, pp. 879-891) as doi:10.1177/0093650212446622. It should be noted that, to ensure impartiality, Dr. Knobloch-Westerwick was not involved in the preparation of this decision, because she is on the faculty at the same institution as the corresponding author. This retraction is in response to inquiries from Drs. Markey (Villanova U) and Elson (Ruhr U Bochum), in agreement with the corresponding author Dr. Bushman. A Committee of Initial Inquiry at Ohio State University recommended retracting this article after being alerted to irregularities in some variables of the data set by Drs. Markey and Elson in January 2015. Unfortunately, the values of the questioned variables could not be confirmed because the original research records were unavailable. In 2016, Drs. Markey and Elson sent their report to Dr. Gibbs, one of the editors of Communication Research, who decided that a retraction was warranted. A replication of the study by Dr. Bushman is in review. Video games are excellent training tools. Some writers have called violent video games “murder simulators.” Can violent games “train” a person to shoot a gun? There are theoretical reasons to believe they can. Participants (N = 151) played a violent shooting game with humanoid targets that rewarded headshots, a nonviolent shooting game with bull’s-eye targets, or a nonviolent nonshooting game. Those who played a shooting game used either a pistol-shaped or a standard controller. Next, participants shot a realistic gun at a mannequin. Participants who played a violent shooting game using a pistol-shaped controller had 99% more headshots and 33% more other shots than did other participants. These results remained significant even after controlling for firearm experience, gun attitudes, habitual exposure to violent shooting games, and trait aggressiveness. Habitual exposure to violent shooting games also predicted shooting accuracy. Thus, playing violent shooting video games can improve firing accuracy and can influence players to aim for the head. Enligt Google Scholar har artikeln redan hunnit citerats 14 gånger sedan den publicerades 2012, bland annat i en översiktsartikel vilket förmodligen förvärrar situationen med tanke på att alla som läser översiktsartikeln förmodligen inte kommer att läsa tillbakadragandet av originalartikeln. 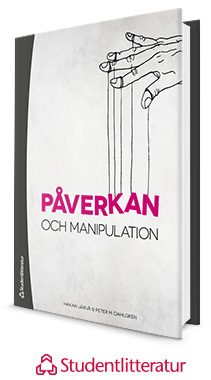 Det är som viskleken för forskning, och mängden myter som florerar inom forskning behöver på inga sätt vara mindre än utanför forskarsamhället därför att det som bekräftar vad forskare tror är också det som i högre utsträckning kommer i tryck. 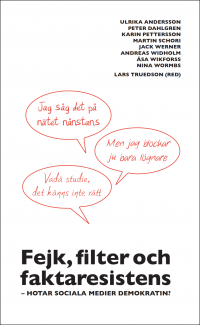 Enligt Retraction Watch var handledaren omedveten om dessa inkonsistenser, och verkar inte ha fått några repressalier.